SYNOPSIS: Super rare James Bond imitation. Except for the occasional tongue-in-cheek wink this is a pretty straightforward spy action film. 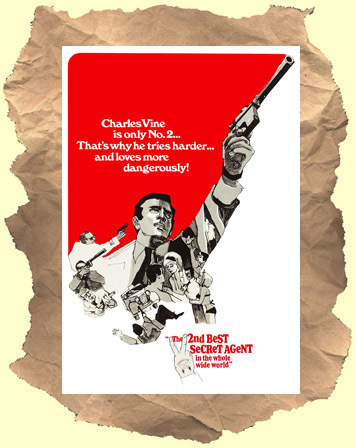 Coming out in the middle of the 60's spy craze this film features a very capable Tom Adams as agent Charles Vine (or Double 00) assigned to protect a Swedish scientist and his gravity device from the Russians. As some gun fans have pointed out he favors a Mauser 696 broomhandle pistol as his trusty weapon. The unmistakable UK location footage gives it an "Avengers" feel at times. Some very enjoyable actions scene that belie the film's low budget. At one point Vine even fights an Asian crossdresser. Sammy Davis Jr sings the theme song. Two sequels followed.